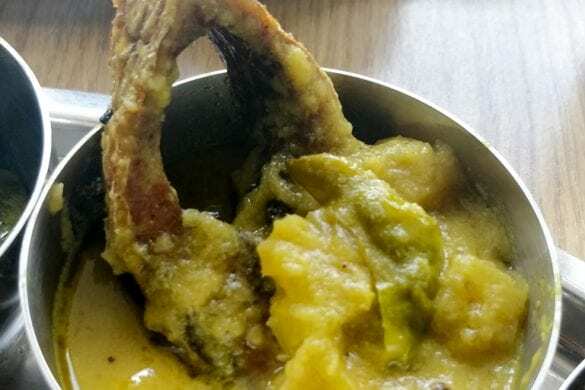 Hilsa, as I always call, is an object of desire for both India and Bangladesh. And such madness is rarely seen anywhere. 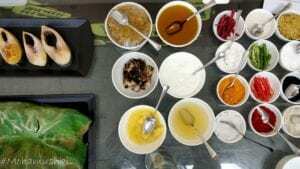 In Bangladesh and West Bengal during Poila Boisakh (the first day of the Bengali New Year), it is customary to have ilish with panta bhat (fermented rice) at breakfast. 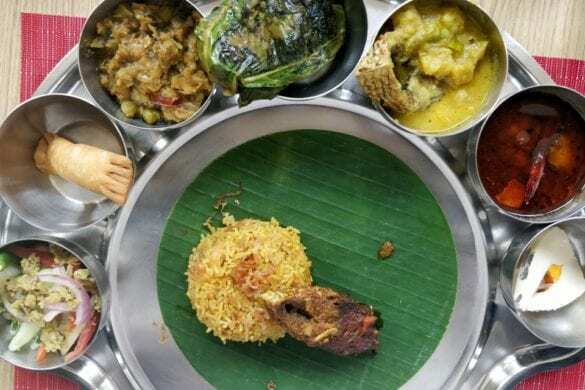 The meal is the traditional way to celebrate the Bengali new year. 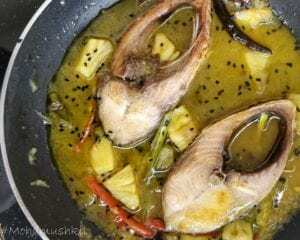 In many Bengali Hindu families a pair of ilish fish (Bengali: Joda Ilish) are bought on auspicious days, for example during special prayers or puja days, some people offer the fish to the goddess Lakshmi, without which the Puja is considered to be incomplete. 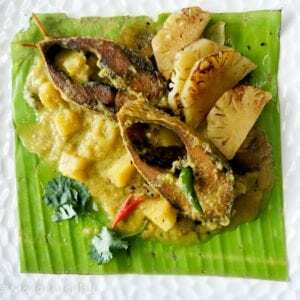 In Bengal, Ilish is also used during wedding as a Tattwa gift. During Gaye Halud tatwa, the family of the groom presents a pair of Ilish to the family of the bride. 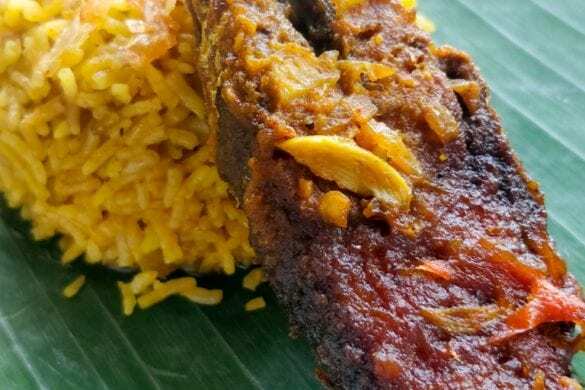 However, due to the scarcity of Ilish nowadays, it is replaced by Rohu in West Bengal while the Tradition continues in Bangladesh. As I said, the whole spread was inspired by Bangladeshi dishes. 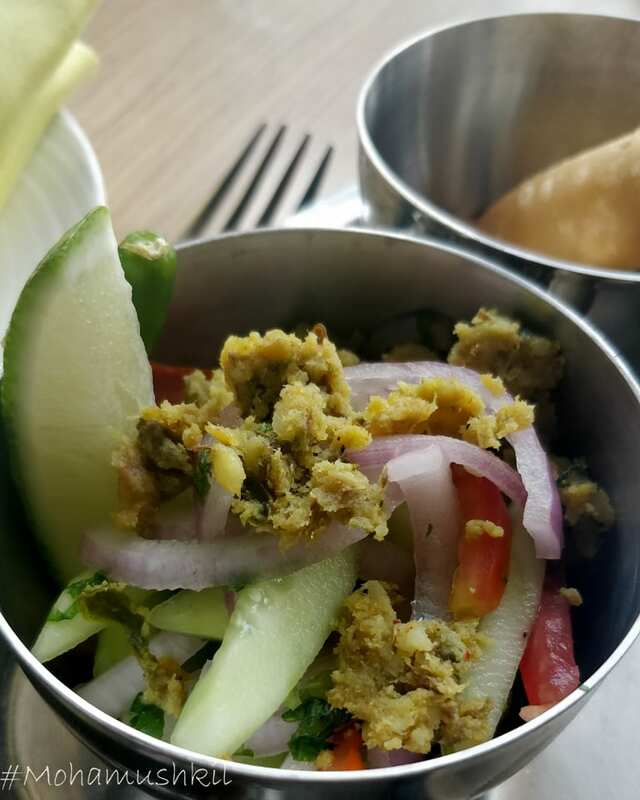 But that definitely did not mean that dishes from this side didn’t get a chance- especially the pithe and salad, both part of their hilsa thali, were their and actually ruling … Mashed fish was used in both the dishes and both were damn good. 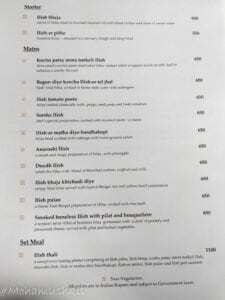 The hilsa thali was priced at a pocket friendly price of 1100+Tax. 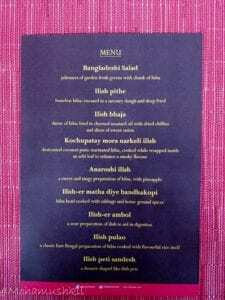 And considering they serve around 7 dishes consisting of a full hilsa body (head to tail), it seemed pretty decent. 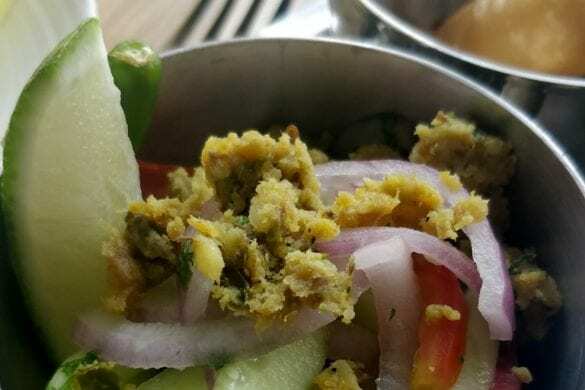 Now, if I talk of the dishes, the starter was hilsa salad. It was mashed hilsa with cucumber, onion and tomato and a slice of gondhoraj lemon. 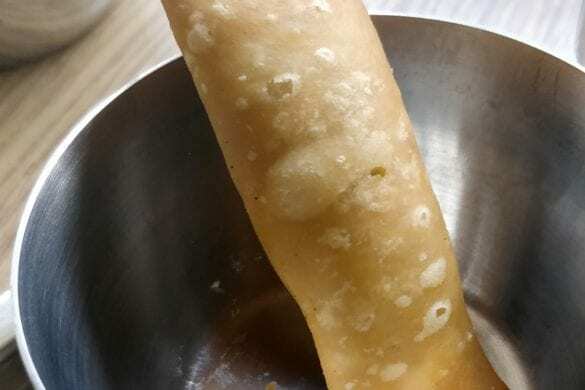 The Hilsa pithe was mashed hilsa, put in a savoury dough and deep fried. 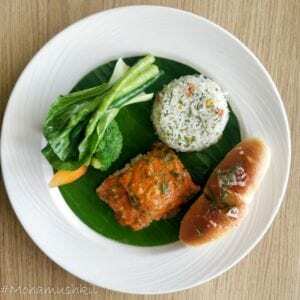 But in the thali, I really like the laupatay mora ilish. 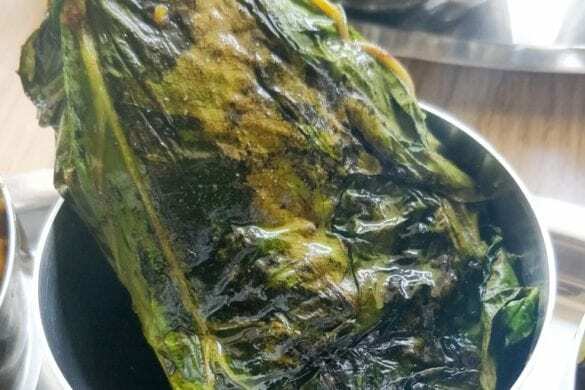 It’s hilsa marinated with mustard and shallow fried wrapped in Arbi leaf. I have got a weakness for pineapple as a fruit, and there was Anarasi Ilish. 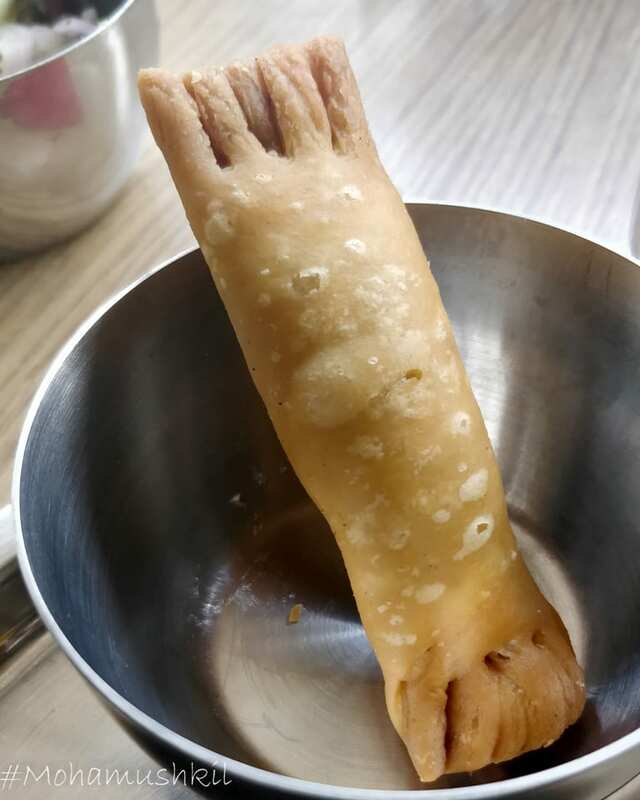 But, I’ll discuss this dish separately. Hilsa head was used with Cabbage. 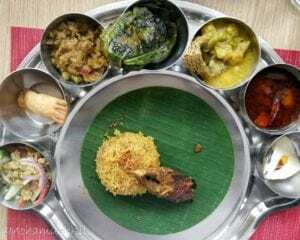 Now, we are normally used to enjoy cabbage with rohu head, and this was definitely a welcome change. 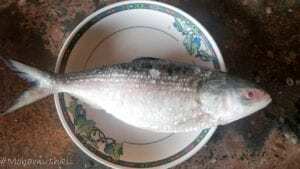 And hilsa tail was used in Ilish-er-ombol. It was sour and tangy- basically a palate cleanser and help the palate to get ready for the sweets. Individual dishes (from the thali) are riced at appr 650/-. As I said above, though I don’t like fruits much, but pineapple is my favorite. So, when I saw here, Hilsa getting cooked with pineapple (both mashed and diced), it was bound to be my favorite. And luckily, I shot the entire dish getting cooked. So, here is the recipe. 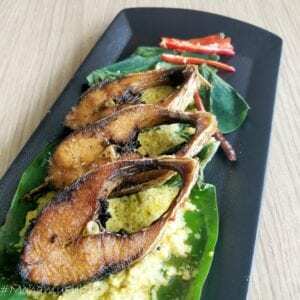 Hilsa with Arbi leaf ??? 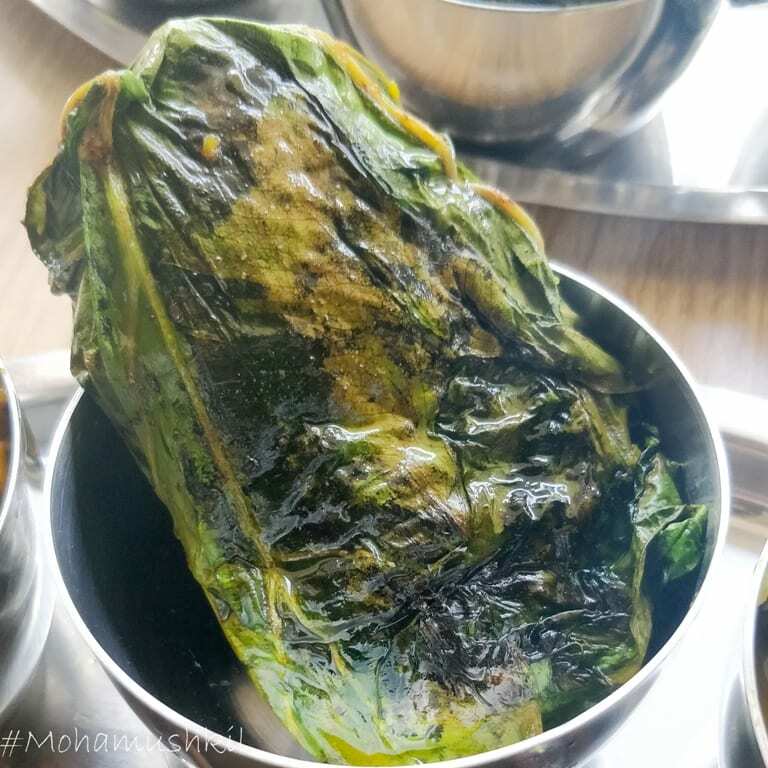 Now, the next interesting dish was Laupatay mora Ilish, Here, Hilsa was basically put in mustard marination and then wrapped into Arbi leaf. The whole parcel was then shallow fried. 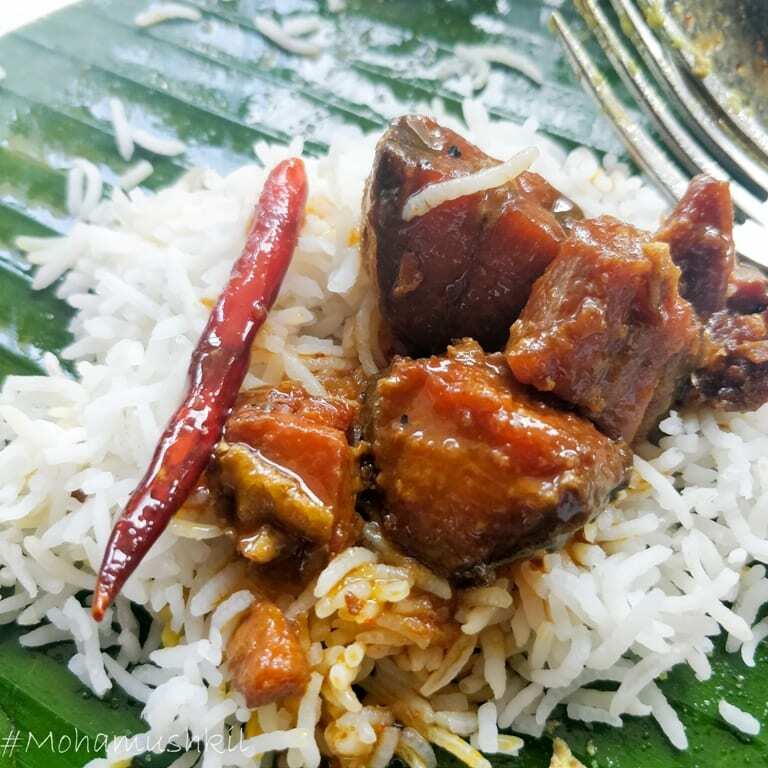 And, as a result, the smell of Arbi leaf imparted a special aroma to the dish. 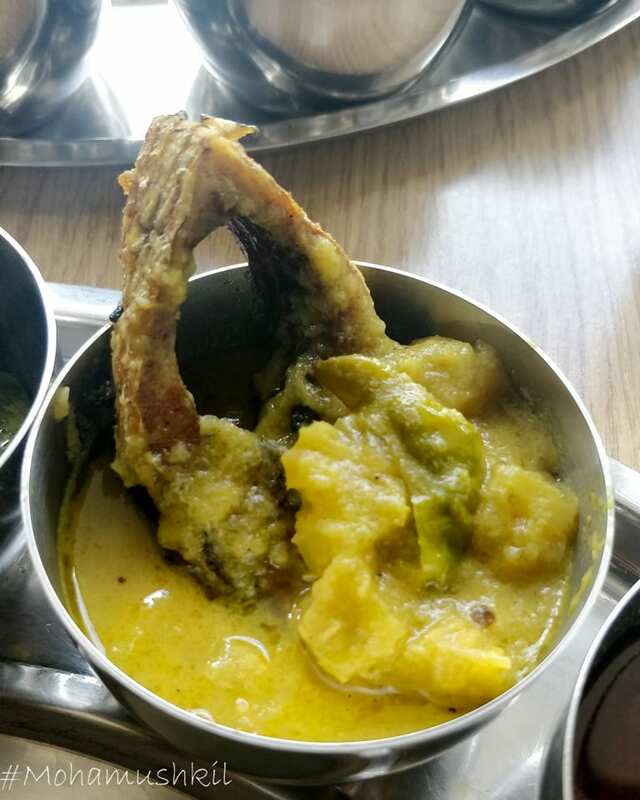 The hilsa piece used was two large Darne, the midriff, but the process of shallow frying has taken care of it. 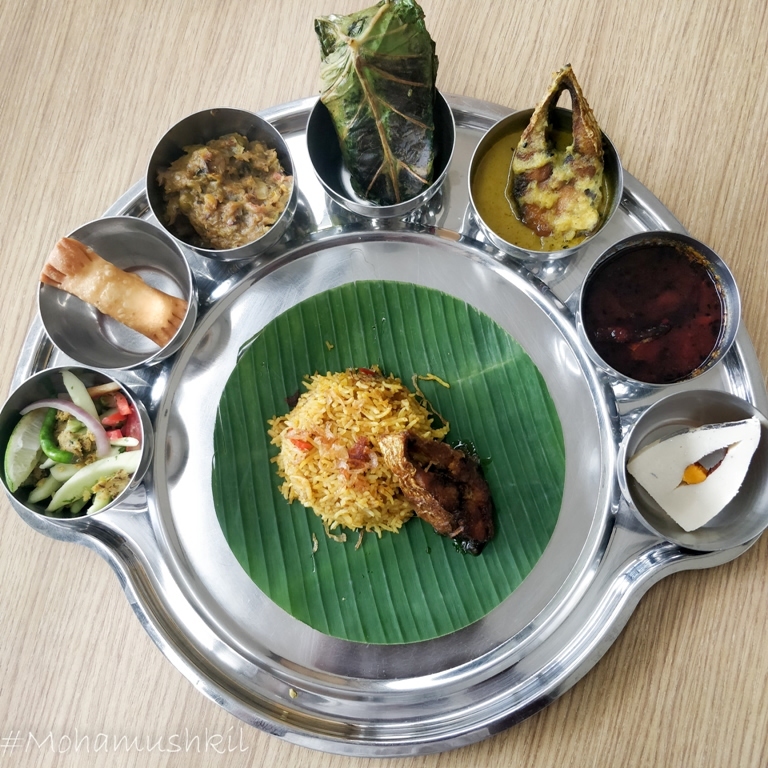 This dish was there as part of the thali, as well can be ordered separately. 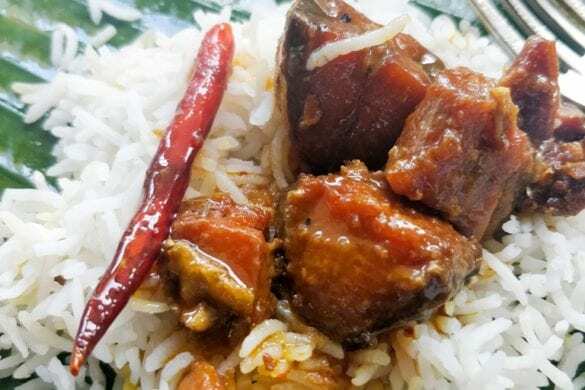 The smoked hilsa was cooked a bit differently here, with a topping of Bar-Be-Que sauce and served with buttered rice. 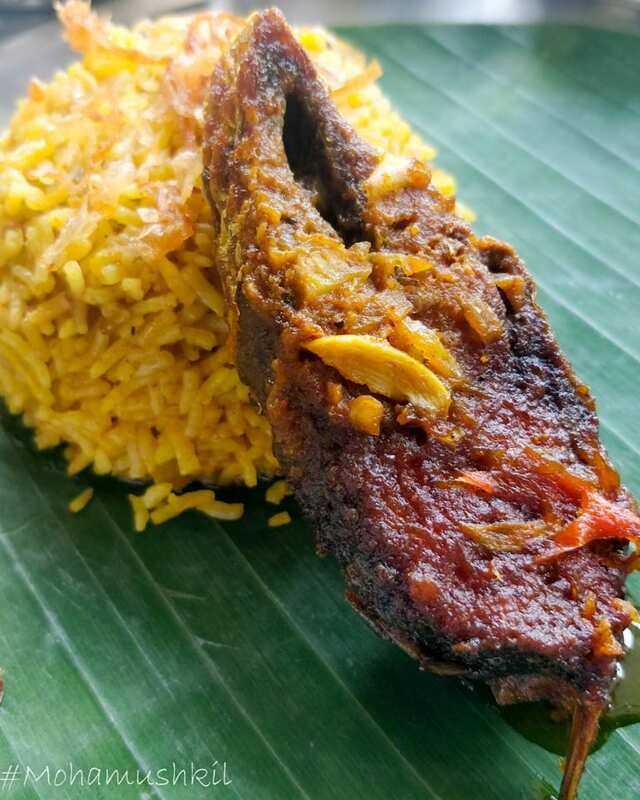 Overall, the experience was definitely good and for someone with a weakness for Ilish, it’s definitely recommended. Do visit and share the feedback ….